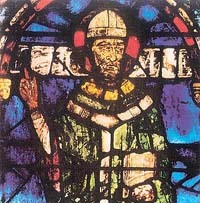 THOMAS Becket, a close friend of Henry II, became the Archbishop of Canterbury, much against his wish, as he knew that the King and the Church had incessantly been at loggerheads. Soon, he found that he was quarrelling with his friend about how the Church should be run. One day, Henry called Becket and accused him of spending his money for the church. Worried that he would be sentenced to death, Becket slipped away to France and returned after an exile of six years. Another row broke out between the two friends. Henry gave way to a characteristic outburst of rage, crying in an unguarded moment: "Who will rid me of this low-born priest?" On December 29, 1170, four knights rode into Canterbury, ready to deal once and for all with Becket’s stubborn opposition to royal interference in church affairs. It was a dark night and the Service of Vespers was being sung. The knights burst into the church and called for Becket through the darkness, scornful and insulting. They tried to arrest Thomas, but he fought back. A sword cut deeply into Thomas’ head, it was a death blow from which he died instantly. Becket’s body was placed in a tomb in the crypt of the Canterbury Cathedral. He had become a martyr because it was said that he had died for his beliefs. This warranted his canonisation, resulting in Canterbury becoming the most popular centre of pilgrimage in the England of the Middle Ages. However, it had been visited by believers much before the time of Becket. The bodies of several saints lay in the Cathedral, as well as pieces from Jesus’ cross, a thorn from his crown, and some wool woven by Mary. This brought ample revenue to the cathedral and its clergy and helped in forming the background to Geoffrey Chaucer’s Canterbury Tales, written during the last years of the 14th century. 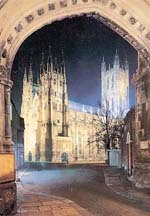 View of Canterbury Cathedral by floodlight. My interest in Becket and in Chaucer had always been at the back of my mind whenever I thought of the beauty, grandeur and the powerfully evocative sense of the past of the Cathedral Church of Christ at Canterbury. Take the road to Dover and on the way do not hesitate to spend a day in Canterbury so as to delight in much of the splendour that still survives in the Gothic architecture and decoration of the church. In the year 597, St. Augustine the first Archbishop of Canterbury adopted an existing church in this thriving town and dedicated it to Christ. This Saxon church stood for over 500 years until 1067, when it accidentally burned. William the Conqueror asked for a new cathedral to be built, and with the help of his Archbishop, Lanfranc, the building was finished very quickly. In 1175, a French architect called William of Sens designed the new cathedral. he rebuilt the Quire and added the Trinity Chapel. The craftsmen had no modern machinery to use, so everything had to be done by hand. The nave and transepts were added in the 14th century, and the Bell Harry Tower, the crowning glory of the cathedral, around 1500. It would cost more than £ 100 million to build the Canterbury Cathedral today. Since this cathedral was built many hundreds of years ago, it has come to have a very special place in the history of Christianity which first came to Britain after the Roman invasion in 43 AD. There were many Christians in England by the time the Romans left, including a small group in Canterbury. When the Anglo-Saxons invaded England, Christianity was almost wiped out. It was only in the year 597, that the Pope sent a group of 40 monks to England to try to convert the people. There was a Saxon king called Ethelbert who ruled in the South, and whose wife, Bertha, being a Christian, persuaded the king to give permission to the monks to build a monastery in Canterbury. 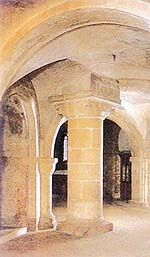 The Chapel of Our Lady Undercroft. On the Christmas of 597, St Augustine baptised 1000 of Ethelbert’s subjects as well as the King who became a devout Christian. This was the genesis of Christianity in England. Canterbury Cathedral has, therefore been a place of worship since the days of the arrival of these monks. It has survived throughout this time as the main centre of Christian faith. No visitor can avoid experiencing the exquisite art of the wonderfully striking stained glass windows. The 13th century stained glass panels in the Trinity chapel showing St Thomas Becket or the scene of Adam the Forester, shot through the neck by a poacher commemorate the many miracles associated with his name. Eight of the original twelve survive, and all are vivid in their range of colours and their lively and spirited composition. Here you can see the knights entering the cathedral; the monks and later, pilgrims can be seen at the tomb and the shrine. The saint’s association with the common people is shown in stories of incredible recoveries, like that of a carpenter who cut his leg off or the naughty boy who played truant from school to go and throw stones in the Medway but slipped and fell into the river. These are only a few among the many images which place the Canterbury stained glass among the richest in all England. On the south side of Trinity chapel you have the effigy of Edward the Black Prince, the stateliest of all the cathedral’s medieval tombs. On the north side is the monument to King Henry IV and his second wife Joan of Navarre, the two of them portrayed in superb alabaster carving under a canopy painted with their royal arms. The cathedral is indeed a visual treasure house. When you move into the Trinity chapel you come to the site of St Thomas’ shrine. The intricate marble pavement laid down in front of the shrine in the early 13th century can be seen in the foreground. Visually refreshing and surprising, the area in the church reserved for the choir ranks among the foremost statements of Early English Gothic. It displays the work of Williams of Sens. The curious narrowing effect before the Trinity chapel was imposed on the designers by the remains of the ruined building from the past. The progressive raising of the floor level to the High Alter, and again to St Augustine’s Chair and beyond it, must have provided a magnificently dramatic setting for the shrine of St Thomas as the focal point of the whole structure. Of all Canterbury’s architectural features it is perhaps the ensemble of the Early English choir with the incomparable grace of this long, high-arched perpendicular structure which makes the deepest impression upon the visitor. The 17th century graffiti on the wall of the staircase leading to the crypt is one of the cathedral’s most enchanting surprises. The splendid Romanesque painting of St. John the baptist is one of its kind. A winged beast on one of the capitals of the Norman crypt shows the exotic influence of Byzantine and Oriental art blending with native English design. 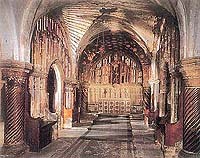 As you step into the chapel of Our Lady Undercroft, at the centre of the crypt you see how it was enriched in the 14th century with delicate screens spanning the Norman arches. You can move on to admire the water tower in the infirmary cloister and the arcaded staircase on the north side of the Green Court leading to Anselm’s Chapel where you can admire the still glowing colours of the painted mural of St Paul. You can then enjoy the music sung by a highly trained choir consisting of thirty choristers, ten lay clerks and two choral scholars. And finally do not come away without visiting the Cathedral Library, with its rich collection of manuscripts and printed books, along with a flourishing publications department. Having survived ancient fires, pillage at the Reformation and onslaught from the Puritan iconoclasts, the cathedral came virtually unscathed through the air attacks of the Second World War, though the city itself was heavily bombed on many occasions. Our own age has seen Canterbury’s complete adaptation to the changing requirements of a notable and majestic church in its service to the community. Over 2 million visitors come here every year. Some come to pray, some come in search of beauty or historical association and some come as tourists for whom it remains a mere museum. But more than anything else it remains a palace of worship, a focal point for the religious aspirations of many millions of Christians, of peace and hope for the future, and a symbol of the living Church in the modern world.